When Tommy got hospitalized at the beginning of this year, I got a lot of quetions in my mind about his immune system. I had a child that had a good health regardles his diagnosis, but when he got sick with a simple cold his immune system couldn't fight back the virus, so in less than 5 days I had a child who couldn't breath on his own. The change from a strong immune system to a weak immune sytem was too drastic. So I began to search for imformation at the hospital while he was sleeping. Here is when I made the question to myself, Should we try vitamin therapy with Tommy? I knew about vitamin therapy since Tommy was in the womb. I even found out about a doctor who was using them in other state and I was planning to travel to meet this doctor. But it was too much to handle. I didn't have my family close to me in those hard moments. So I felt I want to enjoy my pregnancy regardless the diagnosis of my son, so we didn't travel. But I did improve my diet more than what it was already. I prepared most of my meals from scratch and increased the amount of folic acid, which was already higher than the amount recommended –I talked to my OB and she said it was OK, it won't be harmful. I drank a lot antioxidants (pomegranate) because a research conducted by Washington University revealed that Pomegranate juice may prevent newborn brain injuries: "Mice whose mothers drank pomegranate juice had brain injuries less than half the size of those found in other mice." This may be the reason why Tommy did so good as a baby. Going through many books and booklets at the hospital, I found out about Vitamin D3 and many other supplements for a strong immune system. I wanted to know more about how all those nutrients work on in our bodys and how they boost our immune system. I decided to check for the list of nutient, vitamin, minerals and antioxidants in the multivitamins specially created for people with Trisomy 21. Then, I understood why these supplements were selected to create these multivitamins. They support the immune system, brain, thyroid funtion and muscles. A good perfomance of the thyroid is scential for a strong immune system. Many kids with Trisomy 21 have thyroid disfunction, including Tommy. Most of our kids have low muscle tone and fatigue easily. Most kids with low muscle tone have Carnitine deficiency that causes fatigue because the body cannot turn the fat in energy. This antioxidant is included in the multivitamins designed for people with Trisomy 21. Small amounts of carnitiare is Ok for people who has hypothyroidism, in big doses may worsen the hypothyroidism. Searching for multivitamin options, I found out that there are currently three multivitamins in the market that target people with Trisomy 21. Today, I will just talked about my first multivitamin option, MBS PLUS (Dietary Supplement) by NutriChem Pharmacy and Clinic. Should I give it a try? Which vitamin should I should choose for my son? I called to the NutriChem lab to know more about MBS PLUS. They explain to me I didn't have to order the vitamins, they prefered I tried them first. Therefore, they sent free multivitamins samples and the book Down syndrome and Vitamin Therapy: Unlocking the Secrets of Improved Health, Behaviour and Intelligence. 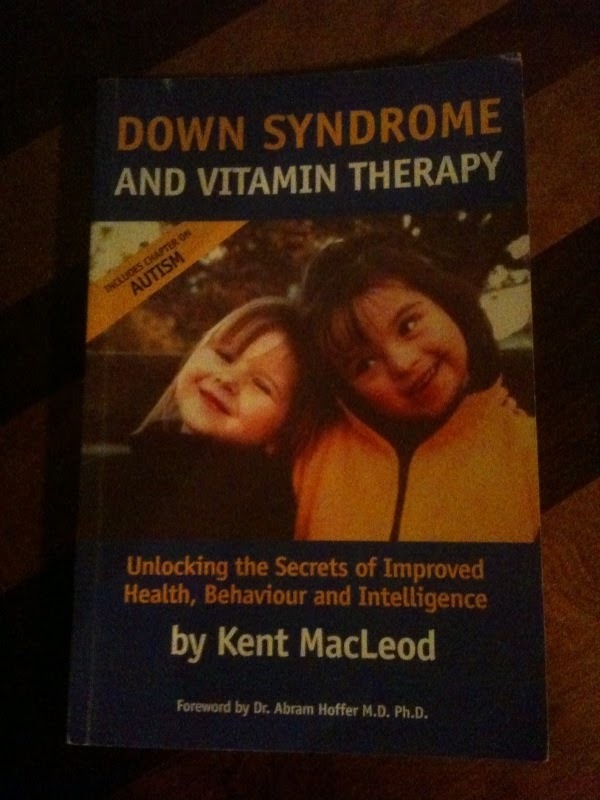 The book talks about how good nutrition keep our kids healthy, the importance of supplements and how they work interconnected; the effects of certain drugs in people with Down syndrome, including antibiotics. The importance of having between two and tree bowl movement per day because decrease the risk for disease. 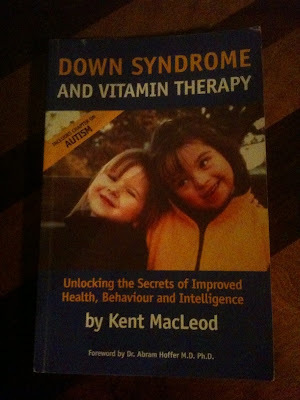 This book also mention the casein and gluten intolerance in kids with Down Syndrome. It also talks about how the oxidative stress affects our kids faster than the typical population. The author even high-light that it is not a cure, but a way our kids can life a healthier life. Therefore, if they are heartier they can learn better. The multivitamin topic is controversial among parents with kids with Trisomy 21. In fact, The National Down Syndrome Congress states: "To date, no vitamin or mineral nutritional supplement is known that will significantly alter the intelligence, physical characteristics or behavioral features of Down syndrome and, thus, none are supported by the National Down Syndrome Congress." The book has good insides about how to keep our kids healthy regardless you decided to use MBS PLUS or not. The books in the USA costs about $30 and $40 in Canada. Currently, NutriChem is giving free MBS PLUS samples with a FREE copy of the book. To get the book and MBS PLUS samples FREE call at 1-888-384-7855. Thank you for the information! I have purchased the vitamins but only have limited knowledge and would like to get the book.